Just like print newspaper designers play up big stories on the front page when it breaks, web editors should do the same on their dot.com front page. At the WCFCourier, we haven’t done this a ton. But we have experimented with a new template provided by Lee Enterprises that helps us give more prominence to big stories on our webpage. Basically, the template blows up the main photo on the story to take up the entire width of the homepage (roughly 610px) and features the first few paragraphs of the story underneath. It also features a nice teaser to photos and any related content (video, other stories, etc.) next to the text. Above is what our homepage looked like last July when a large batch of area troops returned from Afghanistan. 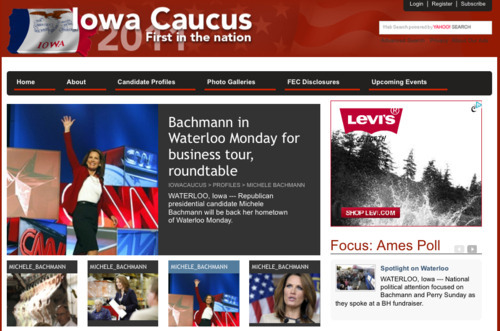 We’ve used this template on other occassions, namely when Michele Bachmann officially kicked off her presidential campaign in Waterloo and the tenth anniversary of 9/11. On Facebook and Twitter, I asked readers to describe their feelings on the homecoming in one word. Using their responses, I put together this Wordle word cloud.